On October 17, 2017, General John W. “Jay” Raymond addressed an at-capacity Rose Auditorium audience about the Air Force Space Command, where he is commander. Located at Peterson Air Force Base, Colorado, the Air Force Space Command provides resilient and cost-effective space and cyberspace capabilities for the nation. In this role, he is one of the highest-ranking uniformed officers in charge of space for the Air Force and the Department of Defense. 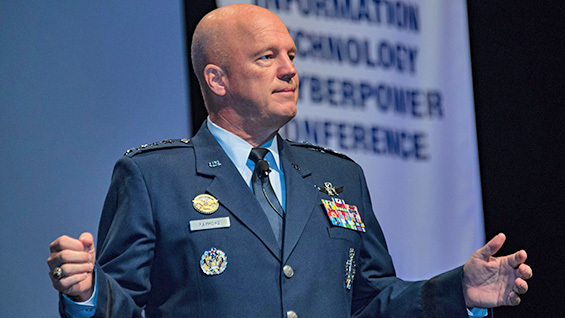 He is responsible for organizing, equipping, training, and maintaining mission-ready space and cyberspace forces and capabilities for the North American Aerospace Defense Command, the U.S. Strategic Command, and other combat commands around the world. General Raymond met Laura Sparks at a leadership conference a few years ago. This fall, she invited him to campus to hold a discussion with students and faculty about popular topics such as space exploration and cybersecurity. General Raymond also had lunch with a small group of faculty and students, including mechanical engineering sophomore Connor Lowry, who were interested in his expertise.